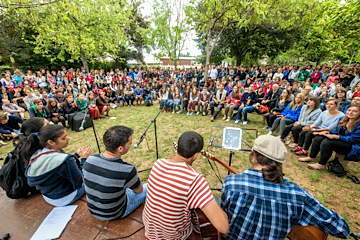 Lots of people have written about their experiences during and after the Gathering for a New Solidarity, which took place from 9 to 16 August in Taizé. Here is a small selection of them. It was heartwarming to take part in a week where history was being made in Taize. Within the community there was an atmosphere of great joy and excitement, while at the same time of peace and nostalgia. We could clearly feel the presence of Brother Roger and it was very beautiful to encounter all of the Taize brothers united in his name. Thousands of young people have already changed their understanding of life, improving their lives and the lives of others. It was especially touching to feel that his legacy will go on, and his spirit still lives within the community; that the Holy Spirit of communion and hospitality is stronger than ever. Joy, simplicity, mercy and faith are the foundations of Taize. Caroline, France When I arrived in Taizé, I was really affected by the unity that is found among thousands of people coming from all over the world. During the rest of the year, I often feel oppressed by the world outside and by news: wars, interfaith conflicts… But here in Taizé, we are together in a spirit of sharing and of peace. Last year, I was really moved by the conflict between Russia and Ukraine. I had the feeling that the European Union was not a reality but a utopia. 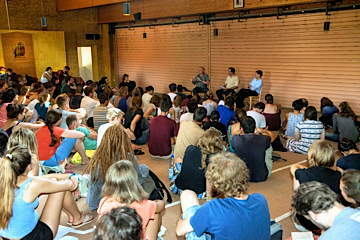 But by coming to Taizé, I realized that Europe was here: unified, singing and praying for peace. Taizé, a place where Russians and Ukrainians talk, play, laugh together, without hate, without violence… a place of peace and communion where we can find hope for the future in spite of our difficulties. For me, this passage sums up the many different ways we attempt to understand and define “solidarity” throughout the week. In discussion with each other and with visiting guest speakers many ideas were collected, such as being open to being more welcoming, not thinking only of our own comfort, speaking out for others and against prejudice, and striving for equality and justice. But how do we do this? As we walk humbly with God in a world where so much is given to us by chance and circumstance, are we able to face the challenge of not only living in a just way, but also doing so with a tender and loyal heart? If yes, perhaps, then we can move towards a new solidarity. The brothers of Taize are not just talking of New Solidarity but they are really striving hard to achieve it. I understood this when I got the privilege to be part of Taize’s New Solidarity Week, or the “Big Week”. I was amazed to see thousands of people, especially youths from different countries, denominations and even religions, singing and praying together in the church, and I thought that the Kingdom of God would be like this. The forums on the topics of mercy, joy and simplicity by younger and older speakers from different viewpoints helped me to understand the real need for these three things in my life to build new solidarity. Carmen, Spain Young musicians from all over the world are showing their skills at the “Festival of Nations”. I have really enjoyed the performance of Yeram, a South Korean volunteer, who delighted us with her warming and overwhelming voice, singing three songs very joyfully and dressed up with colourful traditional Korean clothes. There are many things which can unify people despite their differences, and one of them is art. During the special week we had the Feast of Nations every day. There were individuals and groups of people inviting us to learn about their countries and cultures which was an endearing experience. Participants of these meetings played musical instruments and performed for us. They were not celebrities but in our eyes they were breathtakingly angelic. A boy named Vasyl from Ukraine, and a boy named Sasha from Russia both complimented each other with their talents. Sasha played the accordion and Vasyl sang a Ukrainian tango. It was extremely touching - this was a very special moment of unity. Being together in silence is one of the deepest ways to communicate with each other. However we seldom do this, as most of us live busy lives. On Sunday, August 16th, half an hour of silence in the middle of the day created an atmosphere of peace and unity among the people in the church of Taize. Personally, this was the highlight of the celebration weekend. I was stunned to see how different religious authorities were united through prayer, despite the typical human attitude to feel secure only when divided in small congregations and fight against the “stranger”. 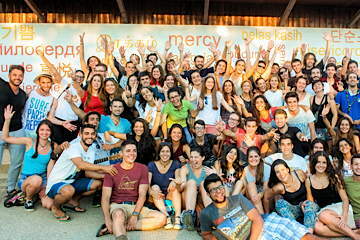 That is the incredible revolution of Taizé: differences don’t restrict but unite us. All nationalities, cultures, languages and denominations of the church come together as one community, strengthened by song and prayer. What I liked the most in the special week was the meeting with the church representatives in the brothers’ garden. It was very touching to witness this poignant moment when, 10 years after Brother Roger’s death, people of all ages from all over the world and from different churches joined together to speak words of unity and communion in the church.